These include 11×14, 12×18, 16×24, 20×24, 24×36, 20×30 or 30×40 poster. These are inexpensive prints, but you will have white areas on the top and bottom that you may want to cut off. This printing technique will print the complete image in any cropped photo without a white edge or loss of image. 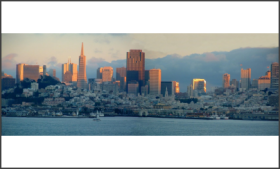 You may also choose to have your panorama laminated or custom-framed at dotphoto’sÂ Custom Frame Shop.